Basic English vocabulary of about 300 words presented in crossword puzzle format. by Joseph Bell Level A1 11,5x19cm, 32 pages ISBN 9788846816122more.. 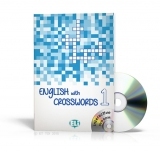 Basic English vocabulary of about 500 words presented in crossword puzzle format. by Joseph Bell Level A1-A2 11,5x19cm, 32 pages ISBN 9788846817778more..
English vocabulary of about 600/1000 words presented in crossword puzzle format. by Joseph Bell 11,5x19cm, 32 pages ISBN 9788846817815more..
English vocabulary words presented in crossword puzzle format. Level: B1-B2 by Joseph Bell 11,5x19cm, 64 pages ISBN 9788846817907more.. The first of a series of 5 activity books for Primary School Children This new series of 5 activity books was created to enable students to review and consolidate the grammar and vocabulary learnt over the school year. Students can practise English independently through involving exercises, whether in class...more.. The second of a series of 5 activity books for Primary School Children This new series of 5 activity books was created to enable students to review and consolidate the grammar and vocabulary learnt over the school year. Students can practise English independently through involving exercises, whether in...more.. The third of a series of 5 activity books for Primary School Children This new series of 5 activity books was created to enable students to review and consolidate the grammar and vocabulary learnt over the school year. Students can practise English independently through involving exercises, whether in...more.. The fourth of a series of 5 activity books for Primary School Children This new series of 5 activity books was created to enable students to review and consolidate the grammar and vocabulary learnt over the school year. 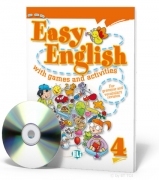 Students can practise English independently through involving exercises, whether in...more.. The fifth of a series of 5 activity books for Primary School Children This new series of 5 activity books was created to enable students to review and consolidate the grammar and vocabulary learnt over the school year. 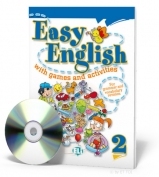 Students can practise English independently through involving exercises, whether in...more..
Merry English on DVD 1 - Stories, songs and fun activities (Book + DVD) The first of a series of 2 volumes Merry English on DVD About the series :more..
Merry English on DVD 2 - Stories, songs and fun activities (Book + DVD) The second of a series of 2 volumes Merry English on DVD About the series :more.. Play with Benjy 1 (Book + English cartoons and activities on DVD) The first of a series of 2 volumes Play with Benjy + DVD About the series : These two fun exercise books are thought to present, revise and consolidate the language taught in the first...more.. Play with Benjy 2 (Book + English cartoons and activities on DVD) The second of a series of 2 volumes Play with Benjy + DVD About the series : These two fun exercise books are thought to...more.. Illustrated words, games and activities The first of a series of three volumes for students of various levels. For learning English vocabulary and structures. Games and various activities are all richly illustrated. Each volume offers 14 units based on lexical themes. Each unit presents approximately 20 illustrated words....more.. Illustrated words, games and activities The second of a series of three volumes for students of various levels. For learning English vocabulary and structures. Games and various activities are all richly illustrated. Each volume offers 14 units based on lexical themes. Each unit presents approximately 20 illustrated words....more.. Illustrated words, games and activities The third of a series of three volumes for students of various levels. For learning English vocabulary and structures. Games and various activities are all richly illustrated. Each volume offers 14 units based on lexical themes. Each unit presents approximately 20 illustrated words....more..
English with crosswords 1 + CD-ROM The first of a series of three volumes for students at various learning levels. The classic series of three activity books for Secondary School students, English with Crosswords, has an exciting new interactive component. 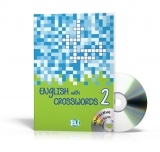 The DVD-ROM generates new crosswords from the vocabulary banks, and automatically corrects and...more..
English with crosswords 2 + CD-ROM The second of a series of three volumes for students at various learning levels. The classic series of three activity books for Secondary School students, English with Crosswords, has an exciting new interactive component. 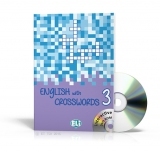 The DVD-ROM generates new crosswords from the vocabulary banks, and automatically corrects and...more..
English with crosswords 3 + CD-ROM The third of a series of three volumes for students at various learning levels. The classic series of three activity books for Secondary School students, English with Crosswords, has an exciting new interactive component. The DVD-ROM generates new crosswords from the vocabulary banks, and automatically corrects and...more..
Excalibur + DVD Video Level: A1 About the series Theatrino The Teaching Theatre: Theatrino is a series of well-known, well-loved stories dramatized in English. These books supplements the play with creative language activities, enjoyable games, songs and the DVD video. These books, accompanied by DVDs, aim to involve...more..